Israeli premier says IDF 'determined' locate and neutralize all cross-border terror tunnels from Lebanon leading into Israel. 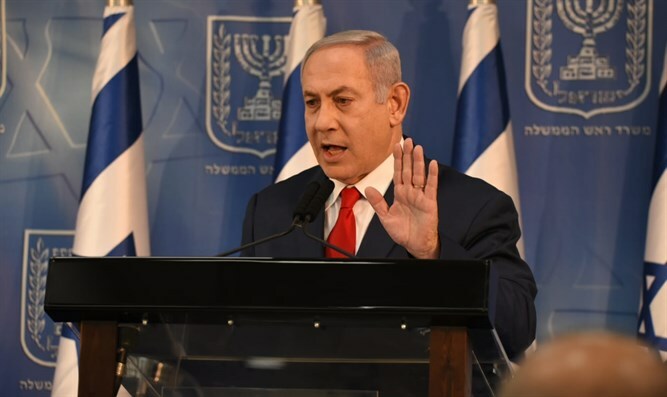 Israeli Prime Minister Binyamin Netanyahu spoke out Tuesday afternoon on the ongoing IDF operation along the Israel-Lebanon frontier, following the discovery of a cross-border terror tunnel originating in a south Lebanese village and leading into Israeli territory. “This morning, the IDF launched Operation Northern Shield, with the goal of uncovering and neutralizing terror tunnels from Lebanon,” tweeted Netanyahu. "We are acting with determination and responsibility in all sectors simultaneously. We will continue with other actions, overt and covert, in order to ensure Israel's security." Earlier on Tuesday, the IDF announced that it had launched an operation along the northern border to locate and neutralize cross-border ‘terror tunnels’ from southern Lebanon built by the Hezbollah terror organization. As part of Operation Northern Shield, IDF forces discovered a terror tunnel leading from a village in southern Lebanon, across the Israel-Lebanon frontier, and into Israeli territory. “A short while ago, IDF troops located a cross-border attack tunnel in the southern area of Kafr Kela. At this time, the IDF is carrying out an operational and engineering process to neutralize the tunnel,” an army spokesperson said Tuesday.